Parent daycare testimonials - Welcome to The Kids Palace Day Care and Learning Center. We are a licensed New Jersey Day care center conveniently located in Kenilworth NJ. Feedback from our parents is one of our favorite things to get! Feel free to shoot us an email with feedback or a testimonial about you and your child's experience at The Kids Palace! "My oldest son attended The Kids Palace when he was younger , before entering elementary school . We LOVE this daycare ! The staff is super friendly and they really care about their kids . My son is now in 1st grade and academically he is doing great ! I have to give credit to The Kids Palace for my son doing so well in school , they really are amazing !" "Incredible team of people! We had our son Phillip at The Kids Palace for over a year and he loved it. We enrolled our son when he was a bit over 2 years old and they were an immense help (especially with potty training). Every day was filled with a different activity. The staff was incredibly helpful being that our son has a specific diet restriction and they made the transition so smooth. We will always be grateful to have found such a great daycare with an amazing group of people!" "My daughter Addison attended the kids palace for 2 years, at first I was hesitant and worried all the time that she'd be screaming for me all day but they made her feel right at home, she'd wave bye and leave me at the door eager to start her day. Miss Jenny, Miss Joy, Ms. Jocelyn and Mr. Royce are all amazing people who really take great care of the children. My daughter loved them all and she loved going to "school" each day. They made sure the children had a routine and also that each day was filled with activities. She had fun playing, learning and made great friends there. It a wonderful family run daycare!" "The Kids Palace is a great Childcare and DayCare for children. My granddaughter is a happy part of the Kids Palace Family for over 3 years. she is alway so happy to go in each day for the various fun and learning activities. The Daycare is family run, and care for the children are exceptional. Joy and Jennifer are wonderful and mainly who I communicate with for the care of my granddaughter. They never disappoint me and I feel comfortable and happy to know that their entire team does such a fantastic job each day. It's amazing how well organized and managed they run the daycare, with lots of trips, plays, games, birthday celebrations for each child. I can go on and on. The Kids Palace is the best and granddaughter number 2 has a second home to go to when she gets here!" "This is an amazing daycare for any child to enroll in. My daughter is going to be 4 and we've had the joy to be part of this daycare since she was 2. Everyone is so attentive to my child's needs. They do so many activities with the children and my daughter is always excited to let me know all about it. Ms Joy Ms Jenny Ms Wendy are all sweet girls and they have so much patience. My daughter already calls them her best friends. This is somewhere to check out if your looking for a reliable, clean, and loving daycare." 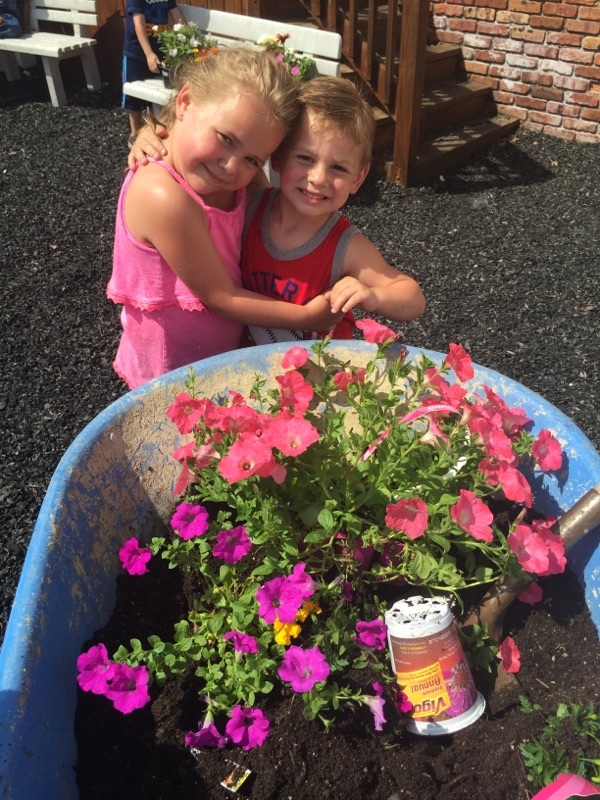 "Wonderful family owned and operated daycare! We enrolled our daughter when she began potty training and they were a huge help. The staff truly loves what they do. The calendar is always full of new crafts, lessons and trips. Very blessed to have found such amazing people to care for my little one!" "I have been with Kids Palace since they have opened and I love it. I can honestly say that Miss Joy and Miss Jenny have treated my children like family. They are a wonderful support and keep my kids engaged with many valuable educational and life lessons. The Kids Palace also transports my children to and from school which is a Godsent as a working parent. On days that the school is closed or if there is a snow day/delayed opening. KP is always there to help out. I would highly recommend KP to anyone. They are always there to nurture, educate and help in any way possible. :)"
Anthony D. And Jennie P.